Only a few crucial pieces of technology keep those 700 horsepower from turning the rear end into a slip n' slide. There’s a distinguishing moment in the history of the automobile when a pair of seemingly inconspicuous Mercedes made history. We’re talking about the AMG CLA45 and AMG GLA45 of course. It has nothing to do with the fact that the AMG nuthouse decided to throw a 355 horsepower bone to its entry-level coupe and crossover. No, it has to do with how Mercedes decided to make all that power out of a small 2.0-liter turbocharged four-banger. More recently, Porsche was tasked with outdoing the Silver Star. It managed that with brilliant prose, but as learned when speaking to rally legend and Porsche 911 GT2 RS build collaborator Walter Rohrl, it was a huge challenge for the team. The hardest part was extracting the power from the engine. Simple math will tell you that Mercedes managed 177 horsepower per liter in its two entry-level AMGs, effectively enough to claim that the automaker is playing with an impending class action suit or mass recall. That ratio was matched by the 4.0-liter McLaren 720S, and then Porsche came around and decided to blow the pair out of the water. 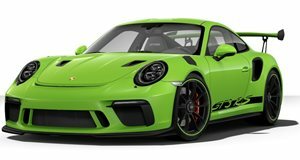 In the GT2 RS, all 700 horsepower comes from a 3.8-liter turbocharged flat-six engine. That amounts to an incredible 184 horsepower per liter. The feat was a must, however, because Porsche hates being second to anyone, even Ferrari. “First of all, [the biggest challenge] was how much power we can get,” said Rohrl. “That was maybe the biggest challenge. We were trying some different things, and finally, it was of course because Ferrari has 680hp we have to try to get 700hp. It was not so easy to get to 700hp.” Reaching that impressive output took equally impressive technology including larger turbochargers and a clever cooling system that uses a spray of water to reduce the temperature of incoming compressed air before making it to the combustion chambers. That wasn't the only challenge, though. Equally as tough was getting all that power to the rear wheels without turning the GT2 RS into a widowmaker. Rear-wheel steering is one tactic Porsche chose to go with, but the electronics behind that have to be just as sharp. “You know, I think the electronics are always getting better and better because I would say, five years ago, it would be no way to have 700hp for rear-wheel drive,” Rohrl told CarAdvice. “But today it is amazing how good it works.” Rohrl seems to think that the system is absolutely essential for control over the car. “Yeah, for sure the rear-wheel-steering is part of using that power safely,” he said. Despite the ingenuity, not every driver, even professionals, .